Relieves post nasal drip. Gently wash away dust, dirt, allergens and pollen. Improve ciliary flow. 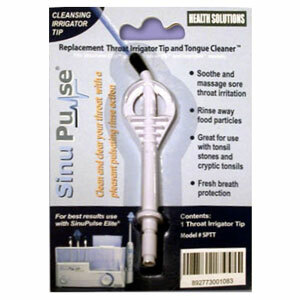 Clear Congestion and prevent sinus infections. Are you one of the millions of sinus and allergy sufferers? Is your nose stuffed up? Do you experience sinus headaches, allergy symptoms, infections, or post nasal drip? Are you tired of the endless decongestants, cortesteroids, antihistamines, antibiotics, nebulizers, and even surgery for sinus relief? 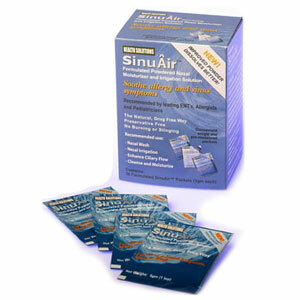 Introducing a better more natural way to relieve your allergy and sinus symptoms. 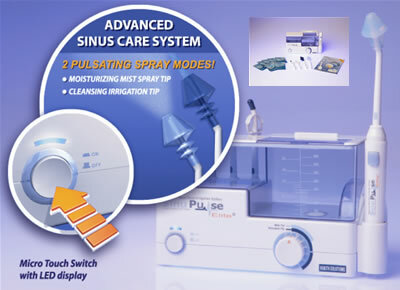 Introducing the revolutionary SinuPulse Elite® Advanced Nasal Sinus Irrigation System. 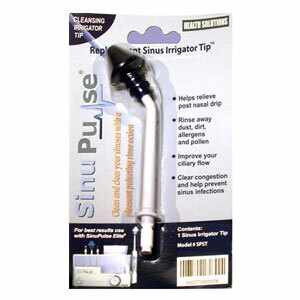 The SinuPulse Elite® Advanced Nasal Sinus Irrigation System is a soothing drug free device to relieve symptoms caused by sinus infections, allergies and the common cold including: post nasal drip, cough, congestion, sinus headaches, and irritated nasal passages. Developed and engineered in Switzerland, The SinuPulse Elite® has been designed by a team of professionals with over 30 years of irrigation experience. Its patented technology is the first and only pulsatile nasal irrigation system designed to deliver both a thorough cleansing pulsatile rinse and a micronized pulsating moisturizing mist spray. 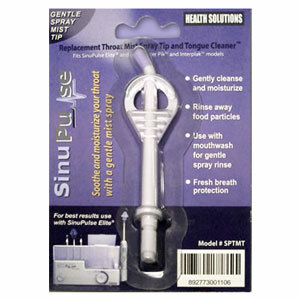 The SinuPulse Elite® and its intermittent pulsing rinse helps prevent sinus infections and relieve the associated pain and pressure. 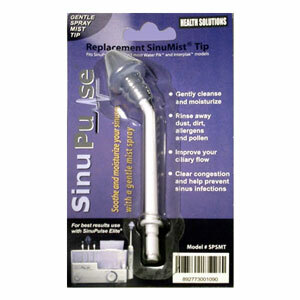 Simple and easy to use the SinuPulse takes only a few minutes to use. Recommended by leading health care professionals and supported by published medical reports pulsatile irrigation helps provide natural relief of allergy and sinus symptoms. The SinuPulse Elite features a state-of-the-art design that includes: Micro Touch on/off button, electronic LED display, hypo allergenic design, fully variable stepless pressure control, pause feature on handle with fully adjustable pressure control, calibrated pulse rate, quiet operation, measurement scale, hi-capacity water tank with hygienic cover, soft color coded nasal tips for family members, and sinus treatment information from Dr. Robert Ivker, best selling author of Sinus Survival. "I recommend the SinuPulse®, which is the premier state-of-the-art irrigation device and the only one capable of delivering both a gentle moisturizing mist spray or a more thorough cleansing pulsatile rinse. 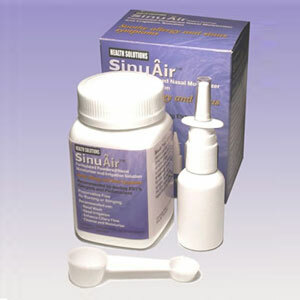 One of the most therapeutic measures in completely eliminating a sinus infection and treating sinusitis. It can help quickly and dramatically." Past President, American Holistic Medical Assoc.